Did you know that London is split in two parts? And I don’t mean the cities of London and Westminster. No, it’s London Above and London Below. London Above is the city most people know. The one with corporate jobs and ultra-modern buildings. But the London Below of Neil Gaiman’s Neverwhere is a whole different world, full of Rat-Speakers and shadow dwellers, with their own rules to abide and secrets to keep. The version I am reviewing is the BBC Full-Cast Dramatization, although the print copy is just as marvellous. James McAvoy voices Richard, who by chance finds a way into London Below, where he discovers that what he only knows as landmarks, suburbs and tube stations are real people in the city underneath. There is an Earl at Earl’s Court – an old man with a tendency to go berserk – voiced by Sir Christopher Lee; Knightsbridge is guarded by actual knights, the Old Bailey is an old, kind man feeding pigeons played by Bernard Cribbins and Benedict Cumberbatch lends his voice to the all-too-real Angel Islington. The cast also includes the likes of Anthony Stewart Head, Johnny Vegas, David Harewood, Sophie Okonedo and Neil Gaiman himself. And what a cast it is! This particular version is dialogue-only, as the voice actors do an amazing job of bringing the world below to life. Even without a narrator the story is easy to follow and all the characters are so well defined and different that not a single one of them seems flat or unimportant. Neverwhere is urban fantasy at its finest. It takes a familiar place and turns it into something incredibly more complex than you could ever have imagined. The way Gaiman brings all the landmarks and places to life borders on genius and begs the question: why has nobody else wondered where such places as Ravenscourt or Knightsbridge got their names from? And if they were people, what would they be like? Only very few people Above ever catch a glimpse of London Below or the people who inhabit it. They choose not to see. For them, some of the folk from Below look like homeless people, and the people Above are used to ignoring their problems. 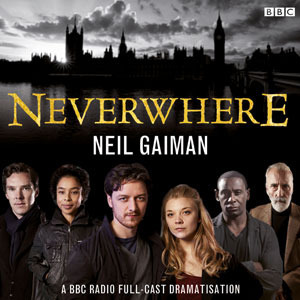 Neverwhere is the perfect gateway story for those wanting to get more into urban fantasy. And whether you read it or listen to it – you’ll never see London in quite the same way ever again.